The next saga in CCM’s RBZ skate line is here. While the skate may look familiar, the JetSpeed has been redesigned from the ground up to drastically improve boot construction, fit, and performance. CCM set out to offer an improved “close to the foot” fit with excellent heat molding properties, comprised of lightweight components. 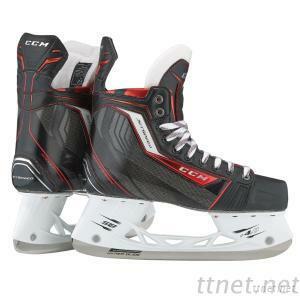 The result is CCM’s ROCKETFRAME™, a fully shaped composite shell with improved heel lock, providing contoured support for maximum performance and speed. The quarter package is supported internally by a heatmoldable SpeedCore 2 Plus. With a natural, contoured shape and great heat molding capabilities, SpeedCore 2 Plus is the perfect complement to the already awesome fit of the ROCKETFRAME™. The upper package is finished with a Dual zone soft touch liner – a SuperDry Lightweight liner with Durazone abrasion patch enhances comfort and helps prolong the life of the boot.